Researchers from the University of Plymouth are appearing in a BBC series examining the incredible changes that take place in the first two years of a child’s life. 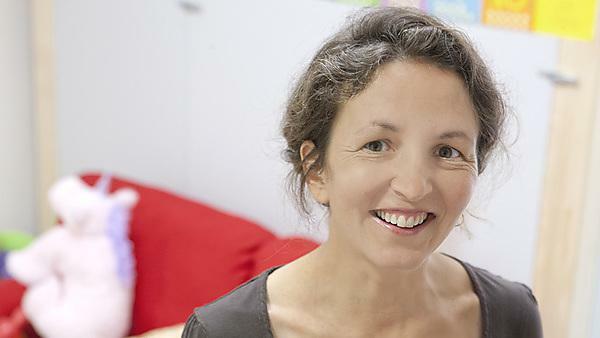 Professor Caroline Floccia, Head of the Plymouth Babylab, will be among the experts featured in the final episode of Babies: Their Wonderful World. The series has brought together over 200 babies and scientists from around the world to take part in one of the most ambitious scientific studies about babies ever attempted. The footage featuring Plymouth, to be aired on BBC2 at 9pm on Monday, focuses on why babies seem to find it so much easier than adults to pick up multiple languages. Professor Floccia carries out a test to see whether babies or adults are better at recognising different sounds from different languages, using sounds from Hindi. Adults struggle to detect differences, whereas the babies can hear them straight away, but this hearing superpower only lasts a short time and by the time they are 12 months old, babies can no longer detect such linguistic subtleties. “Babies are born with the ability to hear all the different speech contrasts, all the different speech sounds found in the world. This is a very, very important ability because when a baby is born it could be exposed to up to 6,000 different languages. The child needs to be prepared to learn any of those languages but by the end of the first year of life, babies start losing this ability. The Plymouth Babylab celebrated its 10th birthday in 2016 and has conducted a range of research into child development characteristics such as behaviours and language acquisition. The episode of Babies: Their Wonderful World focuses on an area which researchers from the University have focused on extensively in recent years, having earlier this year completed a detailed assessment of language development among bilingual families. They have also previously revealed that infants are more likely to recognise words spoken in the dialect of their local communities than those used by their parents. The University of Plymouth Babylab works to improve our understanding of how babies develop their amazing abilities, and the problems they might encounter along the way.